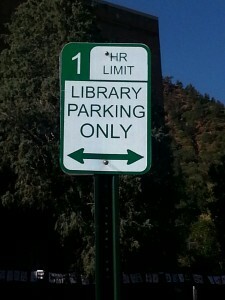 If you are unlucky enough to get a ticket and you are “legally” parked in the Library Diagonal Spots…contact Neal Yowell, the Parking Manager in the parking office at City Hall. Neal’s number is 685-2549 and his email is nyowell@spplus.com. This information comes to us from city employee, Michelle Anthony. She is the Senior Planner in the Manitou Springs City Government organization. Thank you, Michelle!